For the village and castle in Indonesia, see Kastella. "Kastela" redirects here. For the hill and neighborhood, see Piraeus. Kaštela (Croatian pronunciation: [kǎʃtɛla]; Italian: Castelli) is an agglomeration of seven small settlements in Croatia, located northwest of the city of Split, west of Solin and east of Trogir, on the central Dalmatian coast. 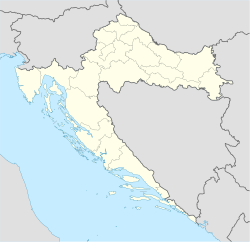 They are part of the Split-Dalmatia County and are administratively treated as a single city with a total population of 38,667 as of 2011[update] census - although they individually range in size from 3,000 to 7,000 residents. The Kastela Riviera is a fertile area, about 20 kilometres (12 miles) in length, featuring the first Roman floating docks and 50 places on the long, verdant area, northwest of Split. It is divided into Gornja (upper) and Donja Kastela (lower), and it consists of seven old and two relatively new settlements. The Kastela region with its Mediterranean tone, picturesque landscape and unique composition of natural environment attracted people since prehistoric times. From ancient Greek sailors, Roman patricians, Croatian kings, rulers, Venetian royals to the present sun and sea lovers, as well as mysterious legacies from the past. The Jadro River (the original water supply for the ancient city of Diocletian's Palace) flows through the town of Solin and provides water supply to both Split and Kaštela. Contemporary studies indicate favourable water quality levels of the river near the headwaters at Jadro Spring. Certain other studies of hydrology and sedimentation have been conducted in this area. The industrial zone is developed, and there is an aluminium extraction facility in the vicinity of Kaštel Sućurac and Resnik, the airport of Split, is also there. Present area of Kastela and its inland in the vicinity of ancient Salona were inhabited very early (the finds from the Roman and Old Croatian period). Kaštela is twinned with Bardejov, Slovakia; Hradec Králové, Czech Republic; Kiseljak and Kupres, Bosnia and Herzegovina; Lindlar, Germany; Přerov, Czech Republic; Pszczyna, Poland; and Zaprešić, Croatia.